What's a PB&J Shot? 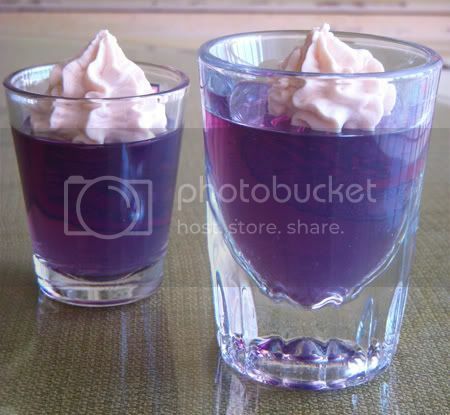 It's a grape Jell-O shot topped with a peanut butter whipped cream. If you're feeling adventurous you might want to give it a try! 1. Make Jell-O according to package directions. For alcoholic shots, substitute vodka for half of the cold water. 2. Pour Jell-O mixture into small plastic Jell-O shot cups. Chill in fridge until firm. 3. Beat 1 cup heavy cream with beaters until soft peaks form. Fold in 3 tablespoons softened peanut butter and 1 1/2 tablespoons powdered sugar. Beat a few more seconds until well mixed. Give it a taste, if it's not sweet enough add some more powdered sugar. 4. Top firm Jell-O shots with a dab of peanut butter whipped cream. Serve. that is a really good idea i espesially like the idea of vaka in it.though idk if it would taste good with it in.bt i so want to make that.thanks for the idea.